‘Two young girls, the Farival twins, were playing a duet from “Zampa” upon the piano.’ For more than a century, this line from Kate Chopin’s 1899 proto-feminist novel The Awakening and occasional performances of the spirited Overture from the same work were as close as anyone outside of France could hope to get to the music of Louis-Ferdinand Hérold. Born in 1791 in Neuilly-sur-Seine, now adjacent to but then just west of Paris, Hérold was a precocious child whose musical talents manifested themselves early on, and his enrollment at the world-famous Paris Conservatoire in 1806, when he was only fifteen years old, brought him into contact with some of the most revered musicians in France, including Charles Simon Catel, Rodolphe Kreutzer, and Étienne Méhul. Six years later, in 1812, Hérold garnered the prestigious Prix de Rome, and 1828 found him receiving the Légion d’honneur from the Bourbon court of Charles X. On 3 May 1831, these honors were supplemented by what is now often cited as the greatest prize of Hérold’s career: the première at Paris’s Opéra-Comique of his Zampa, the Overture from which has, along with the ballet La fille mal gardée, rescued Hérolds’ name from oblivion beyond France and Germany. Five weeks before the composer’s untimely death from the ravages of tuberculosis, his final completed opéra comique opened to acclaim even greater than that lavished on Zampa. First performed on 15 December 1832, Le pré aux clercs proved so popular that it was chosen to formally christen the Opéra-Comique’s new venue, the second theatre in Paris to answer to the name Salle Favart, in 1840, and within forty years of its première had amassed more than a thousand performances in Paris—double the number of performances that Zampa received in the French capital during the same period. Were they en vacances along the Côte d’Azur rather than Louisiana’s Gulf Coast, the Farival twins might well have serenaded Kate Chopin’s Edna Pontellier with music from Le pré aux clercs. A setting of a libretto adapted by François-Antoine-Eugène de Planard from Prosper Mérimée’s 1829 novel La Chronique du temps de Charles IX, the action of Le pré aux clercs is situated against the backdrop of the 1572 Massacre de la Saint-Barthélemy, a mass assassination, perhaps instigated by Catherine de’ Medici, of prominent Huguenots gathered in Paris to celebrate the wedding of the Valois King Charles IX’s sister Marguerite to the Calvinist-leaning future Henri IV, France’s first Bourbon monarch. The violence quickly expanded beyond Paris, becoming one of the bloodiest events in France’s religious struggles. 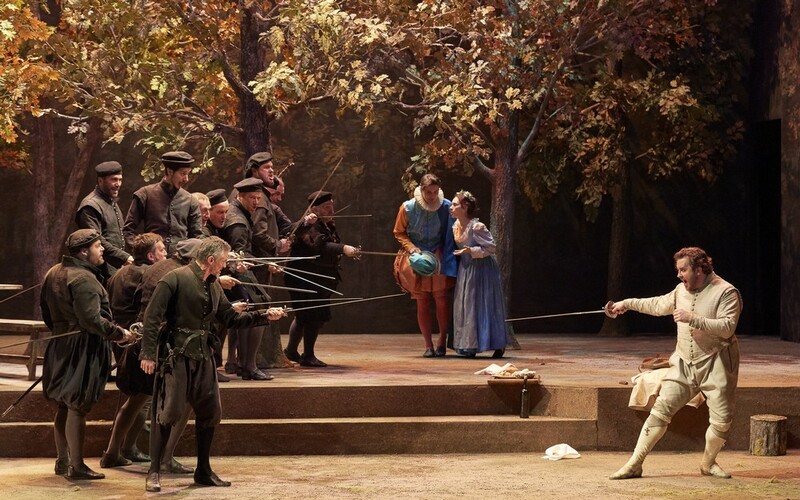 Sharing this milieu with Meyerbeer’s vast Les Huguenots, Le pré aux clercs may seem on the surface to be a daftly light-hearted score, but de Planard and Hérold focused their attention on personal relationships rather than national politics. With his wealth of widely-lauded experience in Baroque repertory, especially Händel’s operas and oratorios, to his credit, British conductor Paul McCreesh approaches Hérold’s score with proven gifts for identifying and imparting drama on a scale that is unfailingly appropriate for the music. Under his direction, the Gulbenkian Foundation chorus and orchestra provide performances that fully substantiate the legitimacy of Le pré aux clerc’s popularity in the Nineteenth Century. As evidenced by the fine singing of members bass-baritone Leandro César as the Brigardier, bass Manuel Rebelo as the Exempt du guet, and bass Tiago Batista and tenor Nuno Fonseca as archers, the choristers are a strong presence in this performance, their sounds granting music and text the immediacy that the opera’s dramatic situations require. Whether in the Overture, the Entr’acte that introduces Act Two, or any of the opera’s scenes, the orchestra’s playing is also an integral component of the musical continuity that McCreesh succeeds in creating throughout the score’s three acts. The conductor’s mastery of a work like Händel’s Saul yields an appreciable comfort with the contrasts among Hérold’s intimate and epic scenes. Even in the opera’s dialogue, which is spoken by the cast with diction that ranges from acceptable to fluent, momentum never flags. Thanks for this is owed largely to McCreesh, whose innate musicality shapes a traversal of Le pré aux clercs that adventurously exposes the many felicities of Hérold’s well-written score to modern listeners’ discriminating ears. Raising the curtain on Act One alongside the chorus with an aptly stirring account of ‘Ah! Quel beau jour de fête,’ the Girot of baritone Christian Helmer and Nicette of soprano Jeanne Crousaud, both benefiting from their portrayers’ native French, converse with dramatic specificity and solid, focused tones. The pair give a fine account of their duet, ‘Les rendez-vous de noble compagnie,’ Crousaud rising with minimal effort to Nicette’s top B♭s and Helmer partnering her with singing of flinty vigor. Thrillingly bringing the ardent Baron de Mergy to life, American tenor Michael Spyres has only one aria in which to exhibit the easy swagger with which his voice and technique can ignite a performance, but he here proves no less incendiary in ensembles, his voice ringing with the fresh sparkle of a crystal goblet whether he is alone on stage or surrounded by the full cast. He traces the line in the recitative ‘Ce soir j’arrive donc’ imaginatively, and his vocalism in the lovely moderato aria ‘O ma tendre amie’ is elegant and beautifully-phrased. Spyres evokes the legacy of Nineteenth-Century French tenor singing by projecting the aria’s first top C with an authentic, gorgeously-managed voix mixte. The subsequent top B♭s and Cs that crown bursts of Rossinian fiorature, subtly and stylishly decorated by Spyres, are sung de la poitrine but equally attractively. 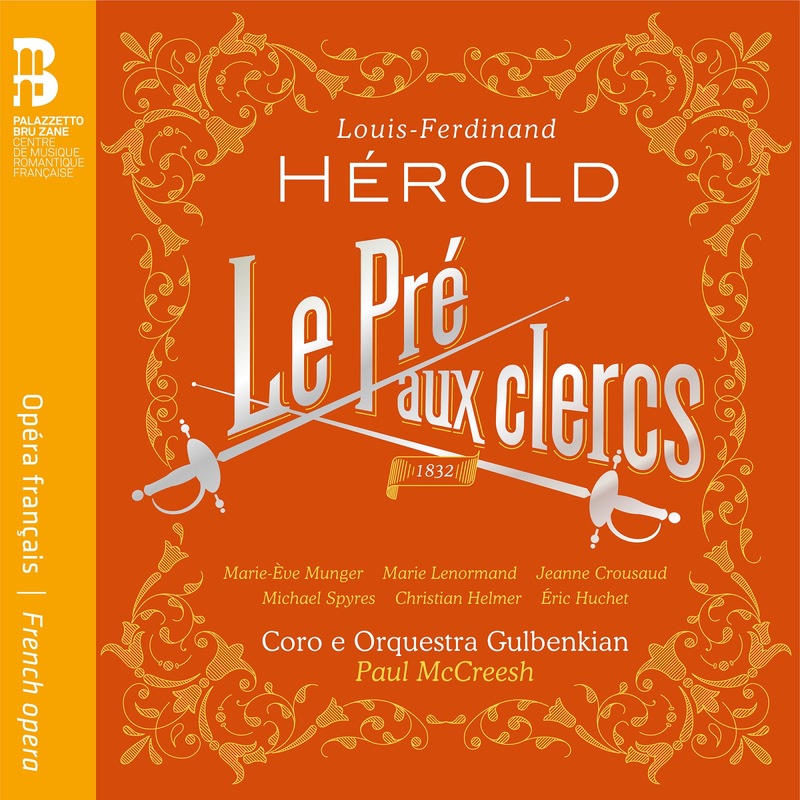 Le pré aux clercs followed Rossini’s Guillaume Tell by less than three years, and Mergy’s music recalls Arnold’s ‘Asile héréditaire,’ music of which Spyres is one of today’s few wholly-qualified exponents. Hérold’s music mostly lacks the edge of brilliance obvious in Rossini’s, but Spyres’s singing supplies the dazzling technical marvels that his rôle demands. In the ensemble that follows Mergy’s aria, ‘Allons! dressons la table!’, the sly Cantarelli of French lyric tenor Éric Huchet emerges with a stream of smooth, lean tone. One of the many relatives in Nineteenth-Century opera of Dandini in Rossini’s La Cenerentola, Cantarelli is always at the ready, a committedly willing participant in actions to further any cause in which he believes, and Huchet strengthens his depiction with consistently animated singing. In the act’s vivid finale, ‘À la Navarre,’ French mezzo-soprano Marie Lenormand and Québécoise coloratura soprano Marie-Ève Munger as Maguerite de Valois and her companion Isabelle de WHAT encounter the stony-hearted Comte de Comminges of Swiss/Chilean tenor Emiliano González Toro. The unforced dignity that Lenormand brings to her embodiment of the distraught queen is not unexpected, this trait being such a crucial element of the singer’s artistry, but it is an unusual pleasure to hear the gossamer-voiced González Toro in a villainous rôle. Owing to the natural allure of his timbre, every line that the tenor utters emits an electric charge of insinuation, and his words convincingly unnerve Marguerite and Isabelle. Munger and Lenormand are ideally matched in their rôles, the former’s flights above the stave complemented by the reliable sturdiness of the latter’s lower register. Each member of the cast exerts her or his presence in the ensemble, ending the act with concerted singing of tremendous impact. Spurred by the orchestra’s sophisticated playing of the Entr’acte, the first scene of Act Two establishes the atmosphere for a contemplative scene for Isabelle that is not unlike Meyerbeer’s scene for her mistress Marguerite de Valois in Act Two of Les Huguenots. Munger sings Isabelle’s aria ‘Jours de mon enfance’ entrancingly. The young soprano’s bravura capabilities are wonderful, but her voice shimmers most alluringly in lyrical passages, her singing of French nasalized vowels having none of the pinched quality that jeopardizes even some native speakers’ performances. In the trio with Marguerite and Cantarelli that follows, ‘Vous me disiez sans cesse,’ Munger sings with confidence, her character’s frightened innocence compellingly countered by Lenormand’s regal bearing and Huchet’s fortitude. The subsequent Masquerade is a scene of inventive dramatic thrust, realized here with abandon that McCreesh controls meticulously without seeming to do so. In the act’s bristling final scene, a few of Lenormand’s highest notes are effortful, but the blazing intensity of ‘Tout est dit’ and ‘Je suis prisonnière’ is heightened by the suggestion of strain. Here, too, McCreesh and the cast evince exciting spontaneity whilst exacting laudable precision and preparation, increasing the finale’s tension with music making of bracing efficacy. The Gulbenkian choristers reaffirm their collective excellence with a mesmerizing account of ‘Que j’aime ces ombrages’ to start Act Three. Building upon this foundation, Crousaud voices Nicette’s ‘À la fleur du bel âge’ with assurance and histrionic involvement that astutely advances the opera’s plot towards its resolution. Spyres, Munger, and Lenormand collaborate in a fantastic performance of the best number in the score, the trio ‘C’en est fait!’ Spyres infuses Baron de Mergy’s lines with golden-toned Romanticism, his navigation of difficult jaunts through the passaggio winningly assured, and he seems to truly listen to the ladies, the colorations of his vocalism growing brighter as he fully absorbs that Mergy and Isabelle are to be united in safety. It is impossible to imagine Mergy’s music being sung better by any tenor past or present. There are foreshadows of the Marschallin in Der Rosenkavalier in the benevolent Marguerite’s interventions on behalf of the young lovers, and the integrity of Lenormand’s vocal demeanor would be a credit to any portrayal of Strauss’s noble character. Lenormand’s singing in this performance harkens back to the bygone era in which French singers like Germaine Cernay, Solange Michel, and Suzanne Juyol conveyed great passion with vocalism of exquisite poise. Munger, on the other hand, is representative of a new species of singer, one in whose endeavors lessons of the past are integrated with the stylistic versatility and cinema-worthy acting expected of today’s singers. Hearing her Isabelle in this performance, it is no surprise that she is a noteworthy interpreter of Gounod’s Juliette, of whom the delicate Isabelle is a kinswoman. The opera’s finale, launched by a sonorous ‘Je frémis!’ and concluded by a jagged, then jubilant ‘Nargue de la folie,’ perfectly summarizes all that came before, both in Hérold’s score and in this performance of it: leaving nothing to chance, every voice and instrument is dedicated to making every word and note count, and the final tally amounts to a Le pré aux clercs that surprises and satisfies. One of the continuing amazements of opera in the Twenty-First Century is the obscurity in which many rewarding scores slumber whilst other works, some far less deserving of attention, are revived with enthusiasm and even relative frequency. Perusing the performance diaries of European theatres and festivals, one might reasonably presume that virtually every opera composed between 1650 and 1750 is a masterpiece, so regularly are Baroque operas brought back to the stage. There are forgotten gems from every epoch of opera’s remarkable history, many of which were celebrated as extraordinary achievements when they were first performed, and there are also scores that can sound more accomplished than they can justifiably claim to be when performed especially well. Louis-Ferdinand Hérold’s Le pré aux clercs might rightfully answer to both of these descriptions. It is a score of undeniable quality, but the performance that it receives on the discs, handsomely presented by Ediciones Singulares and generously sponsored by Palazzetto Bru Zane, gives the opera a stamp of importance that makes it seem the equal of the finest of its contemporaries. If it is not quite that, the illusion is nevertheless fabulously fulfilling.